Endorphin Powered Hypnotherapy contains ten clinically sound, versatile, licensed hypnosis scripts, all featuring endorphin release. 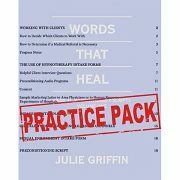 These hypnosis scripts demystify the endorphin release procedure, enabling you to confidently facilitate these versatile healing and empowerment techniques. The hypnosis scripts in Endorphin Powered Hypnotherapy will provide hope, healing, positive insight, and motivation to you and your clients. Put endorphins to work for you and help your clients to feel good!